Information to help you find answers on how to operate the Amateur Satellites. 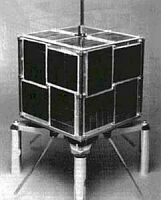 There were many times when I wondered if it would be possible for me to also receive the amateur satellites. It is now a few years ago when I started looking for all kinds of information needed to receive my first satellite. Eventually we managed to receive DO-17 (It is not operational anymore). And then finally that moment that the sounds of the satellite came from the speaker, that moment I will never forget. All the effort was not for nothing. What do you need to listen to the Satellites? A VHF and / or UHF receiver, transceiver. For people who use Microsoft Windows, I recommend starting with Orbitron. This program has everything insights and easy operation. Configure your locator and download the TLE data from within the program and select an amateur radio satellite. There are a couple of strong satellites such as RS-30 and HO-68. Both transmit CW telemetry data that you can decoded easy with your favorite CW decoding software. Listen a couple of times and experience the behavior of a satellite in orbit around the earth. Now you get to a point that you want things simplified and optimized and where to begin is your choice. Connect your receiver to the computer to automate frequentie correction and / or install new antennas for more and better signals. It is up to you. I hope this information is useful for radio amateurs who are interested in receiving satellite signals.